It took me 1.5 months of the expansion until I tired of the garrison mines. I don’t know if that’s a good run, or a troubling sign of garrison gameplay being too much of the grind. I have three level 100 characters by now: Kadomi, protection warrior; Yatalai, frost death knight and Yacoran, holy paladin. In order of play preference, really. Going into the expansion I was totally excited to be a warrior again. I missed it. I was most excited for the new gladiator stance, it was everything I ever hoped for as protection warrior. Or so I thought. Ultimately, I was unable to make it work for me. It received nerfs that it probably deserved, but that’s not why I gave up on her. Shield Charge buffs the damage of Shield Slam, Revenge and Heroic Strike, in a very tight 7 seconds window. As Shield Slam is your hardest hitter, you want to use it twice during each Shield Charge. With Unyielding Strikes, you also want to spam Heroic Strike during Shield Charge, but also Devastate a lot to proc Sword&Board for more Shield Slams. That’s a frantic 7 seconds. I went to one raid as gladiator, and did not perform well. I already struggled with not clipping the GCD, missing the 2nd Shield Slam, on a target dummy. Insert Tectus and tons of movement. After the raid I compared logs, and the other gladiator had higher DPS. Our only difference was the amount of Devastate spam. I don’t care for a playstyle where you have to spam abilities constantly. 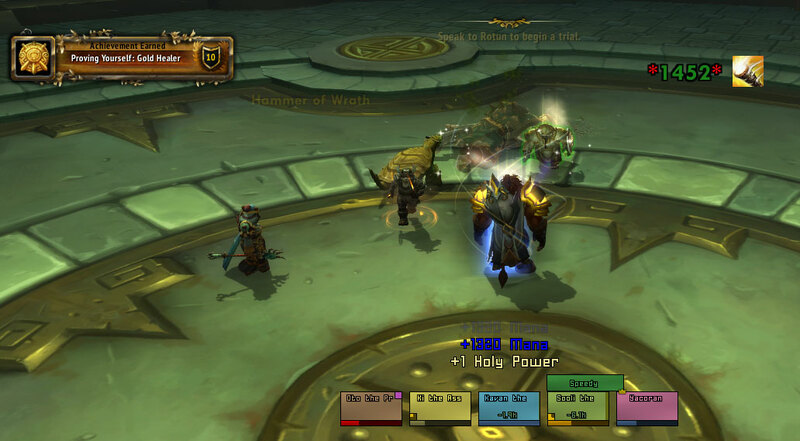 It reminds me of TBC where I had Heroic Strike bound to my mousewheel and pretty much rolled it non-stop every fight. I don’t care for the other two DPS specs of warriors either. Fury and I haven’t gotten along since vanilla, and I never felt like trying Arms. I might still do that, eventually. What it means that Kadomi the warrior plummeted from main status to garrison alt. Mind you, she’s still getting decent gear. I do a lot of 630 missions on her, and so she has a lot of 645 items, including a weapon. I just wish I loved playing as gladiator. I really do. I did enjoy tanking as warrior, and maybe one of these days my guild will need an offtank for alt raids. I think I might enjoy that. Plan number 2 was to go back to the character I played throughout MoP: Yatalai, my DK. Frost is in a good place in WoD, and I enjoy playing both 2H and DW playstyles. DW will remain my favorite, and that’s what I play. I went to one raid again, and did okay even though I was just above ilevel 625, and that was before our Christmas break. During Christmas break I leveled my paladin. I have always had a soft spot for holy paladins. I last raided as such in Cataclysm, on the only Alliance character of note I have ever played. In MoP my paladin did all LFRs, but no real raids. At 100, I switched to holy, and mostly taught myself how to play in Proving Grounds. I know there are a lot of people who don’t care for them, as they’re not balanced for all classes, but as far as healing goes, you pretty much learn how to use all of your toolbox. That was actually a lot of work. Wave 9 is harsh! I did dungeons to gear myself, and it was horrible. I have pug-healed since Wrath and I have to say that I have never been treated as horribly as I was just now as healer. It was a bit depressing to non-stop spam flash heals on tanks to no avail because they failed to avoid mechanics or mitigate enough, and then get yelled abuse at. I learned that UBRS with 3 melee is the worst that can ever happen to you. I further learned that most DPS do not understand the 2nd boss in Grimrail Depot, or how not to stand in fire. But nothing aggravates me as much as the wall jumping nonsense in The Everbloom. The jumping takes longer than the trash pulls would. For real. Everbloom is the worst. A guildie and I went through like 5 tanks, who left, because people didn’t wall jump fast enough for them, or because the group failed on a boss, and so on and so forth. You really pay your dues to earn that 680 ring. Despite all that, I prevailed. I got my 680 ring. I cursed about Khadgar and his pet sucking so much at the Kairozdormu fight. I later learned that people do much better picking healing as challenge and then burn through it as DPS. Huh! I never knew. I had 15 Savage Blood together after spending tons of Primal Spirits and had to make a decision. Upgrade an item for Yata or upgrade an item for Yacoran. The paladin won, because I like to challenge myself. Guess I am a healer main now. I’ll keep you posted about my further adventures, but for now I am really excited. I healed in two raids, and I did really well. At least it felt I did well! One day I might be as good as Fabulor even, who managed to be 97th percentile on H Kargath. Not bad at all! My guild is currently 5/7 in normal Highmaul and 1/7 Heroic. We’ve wanted to do more heroic but were missing folks. I feel we’ll probably get Kor’agh on normal very soon. Exciting times. If it weren’t for all those damn mines in three garrisons. These are exactly my feelings about The Everbloom too! Just why do people do that? It seems so studip. People want to hustle pugs because they’re terrible because people hustle, err wait a minute? 1. If you are Horde US, feel free to add me TedtheThird#1626. I will tank for you anytime I can. 2. Have you thought about trying out Tankadin or Ret? I’m completely bias because I’ve loved the class for a long time but I think Tankadin is about the most fun you can have in the game and Ret puts out pretty good DPS and might give you that Arms or 2H feel. I play on Argent Dawn-EU, but thank you for the offer. As for the other paladin specs, I leveled as ret of course, and go about my daily business as ret paladin. Since they got rid of Inquisition (hallelujah) I find it very enjoyable, but it is not anywhere near the fun factor of frost DKs for DPS. It is more fun than fury warrior for me, I’ll give it that. Not really interested in tankadins, afraid to say. I am sure they are fun, but that’s definitely not an offspec I would want to have on my paladin. Kadomi is still a protection warrior, and Yatalai has blood as offspec if I get the urge to tank.